In ungreased 2-quart microwavable casserole or 8-inch square microwavable dish, arrange apple slices. In small bowl, stir remaining ingredients until crumbly. Sprinkle over apples. Microwave uncovered on High 7 to 10 minutes, rotating dish 1/2 turn after 5 minutes, until apples are tender. Serve warm. Good choices of cooking apples include Rome Beauty, Golden Delicious and Greening. You can bake this simple dessert in the oven. Grease 8-inch square pan or glass baking dish with shortening or cooking spray. Decrease oats to 1/2 cup; increase butter to 1/3 cup. Bake in 375°F oven about 30 minutes or until topping is golden brown and apples are tender. 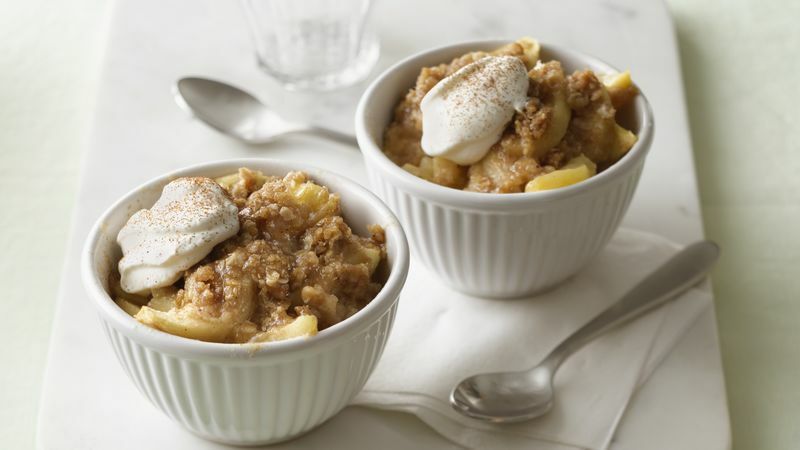 Serve this warm, fragrant dessert topped with a dollop of whipped cream or a scoop of cinnamon ice cream.